LIFE IN LAGOS : SISI WEEKLY #26! Hello lovely people, I didn't want to spam you yesterday which is why I didn't upload this on my blog however it was on my youtube channel which is why I haff say you should SUBSCRIBE, you will always be the first to get my videos! Had so much to do this week especially as Christmas is just around the corner. We went to HansandRene for the first time and I had their Zobo sorbet and Agbalumo one...it was so so so yum!!!! I'll still chat with you before Christmas (I promised to upload my Christmas recipe) but if I don't Merry Christmas in advance! God bless you! I always look forward to your Vlog Sisi. Compliments of the season to u and your family. I love you Sisi Yemmie!! Sisi, I thoroughly enjoyed this week's vlog! That bride at the second wedding can dance eh. Your in-laws are so sweet. Looks like you have bonded well with them and that is a good thing. You and your camera everywhere... see as Mumsi and Popsi don enter YouTube. Have a blessed week! Lovely vlog as always. Great to know ur hubby is back.That scene that showed bobo n Tito was epic. No need for DNA test lol. The scene that showed them sleeping I mean. NEW YEAR'S EVE MAKE UP TUTORIAL! LIFE IN LAGOS : SISI WEEKLY CHRISTMAS EDITION! ERADICATE OBESITY AT A DISCOUNT RATE! OWAMBE : HOW I TIED MY GELE! LIFE IN LAGOS : SISI WEEKLY #25! LIFE IN LAGOS : SISI WEEKLY #24! HOW TO COOK DELICIOUS BANGA RICE! 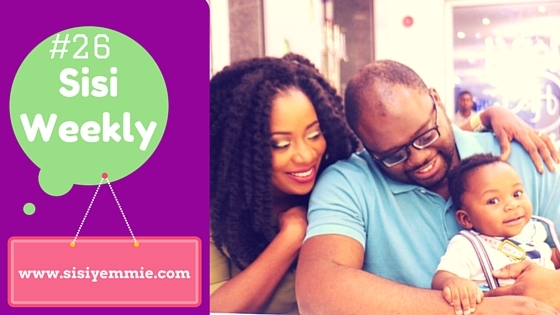 LIFE IN LAGOS: SISI WEEKLY #23!